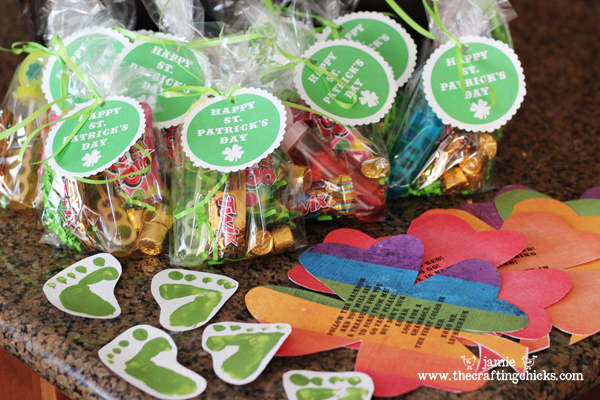 Last week I posted my Leprechaun Rainbow Hunt Shamrocks and wanted to share with you fun things I found for the leprechaun “loot” or treasure, as well as a fun way to make sneaky little leprechaun footprints. 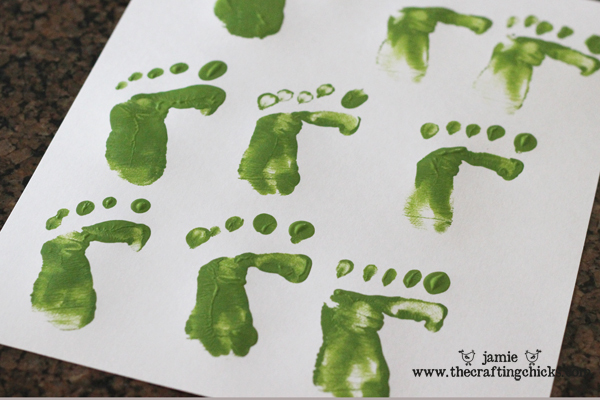 Since leprechauns are so tricky and sneaky how fun would it be for your kids to wake up to little green footprints. You could also rearrange things, die the milk green, or use bistro markers to draw mustaches on family photos-silly things. These all would make my little ones laugh! 1. 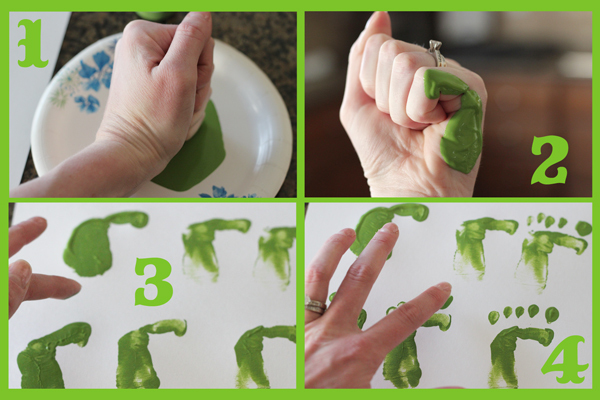 Get some green paint ready on a paper plate. 3. Stamp your fist on the white cardstock or surface. 4. And last, to make toes, use your finger tip and create 5 dots above the foot to make 5 tiny toes. You can do this with both hands to make left and right feet. 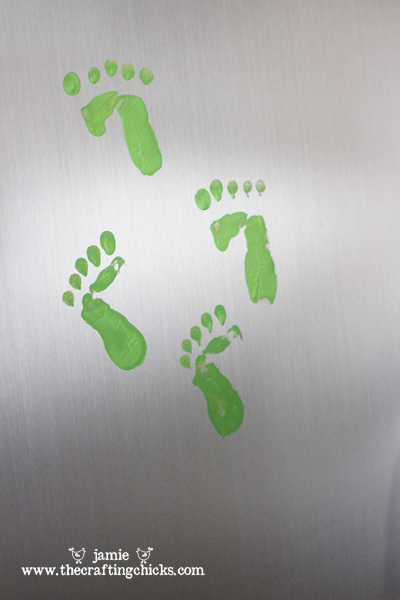 You could even stamp the feet directly on surfaces that are washable. I stamped these on my fridge and they are easy to clean off. It is fun to place the little feet randomly throughout a room. 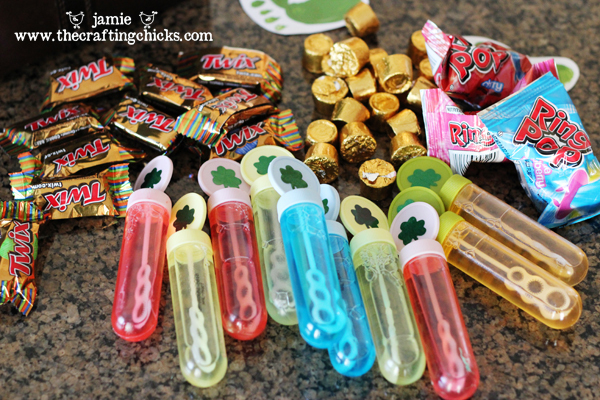 Here are some treasures I found for the “loot.” I found these little bubble wands at Walmart, removed the fishy stickers and added shamrock stickers. Gold candy (twix and rolos) and ring pops are always good for a treasure right?! 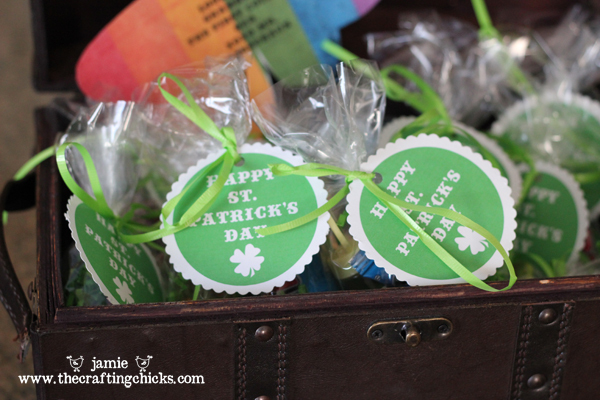 I also made little tags that say “Happy St. Patrick’s Day” to tie to the treasure bags. 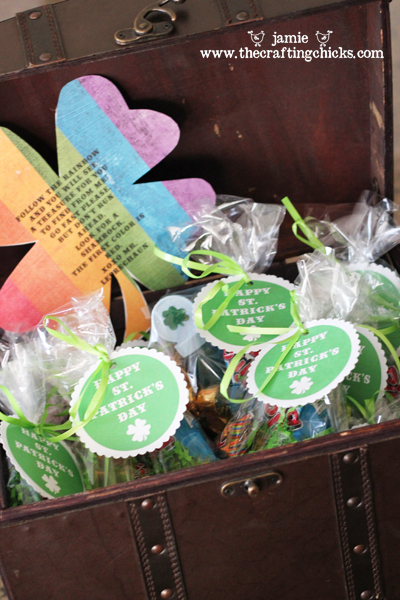 What are some fun things you do with your kids on St. Patrick’s Day? This is so magical! Thank you for always being so generous to our Happy Homes! Our leprechauns turn our toilet water green and eat all of the marshmallows in the Lucky Charms cereal!!!!!! Very cute idea! I love the footprints. I used to make footprints like than in frosted windows when I was a kid! I did this last year…and while tucking them in tonight they r soooo excited to see if they can find leprechaun footprints with gold coins! I added glitter to the pain for extra pizzaz! Oh how I love you friend! 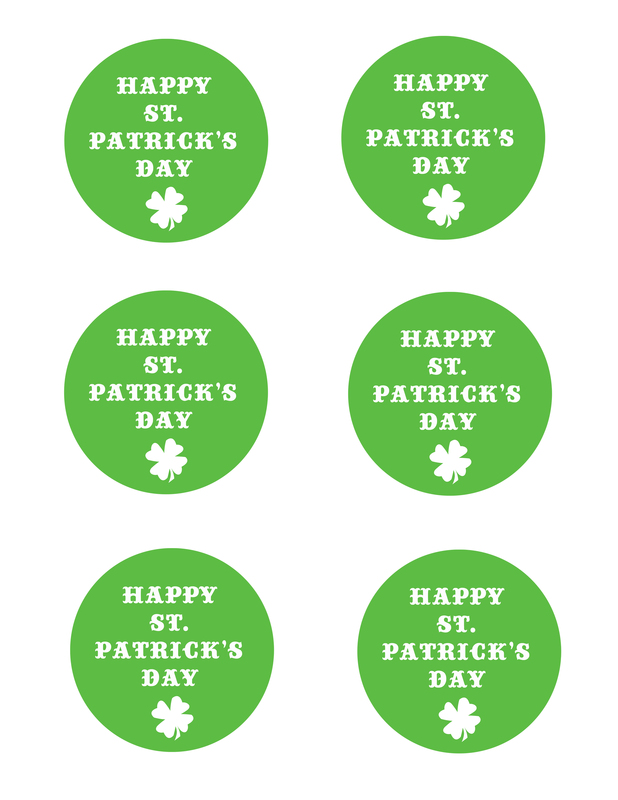 Your St. Patrick’s Day ideas are so cute!!! Thanks so much for sharing!!! I thought I was going to have to borrow someone’s baby for the footprints! lol Thanks for saving her. Great ideas. Great idea! I’m going to use it with my students next week. Thanks for sharing your ideas and the treasure hunt. Can’t wait to surprise my boys in the morning. 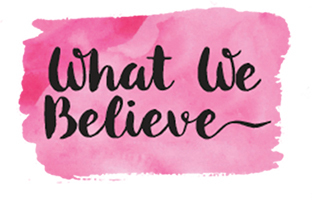 love your whole website!! Cute ideas and using some of them!! Thank you! !